Add a special touch to the meaning of the holidays by having your kids or family members write holiday postcards to friends and other family members. Each postcard has a matching gift tag and special note paper. Special notes can be written by your kids anonymously to their classmates and displayed in your classroom. Black and white templates are included for each of these. BONUS! With your purchase you will receive FREE UPDATES FOREVER at no charge! If you’d like to see more of my resources, please follow me by clicking on the star near my name. 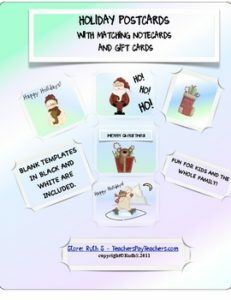 My ready to print resources save teachers time! Book Report Trifold Use with any book or story. Bloom Ball Reports Use with any fiction, nonfiction or subject. Based on the latest Bloom Taxonomy verbiage. These reports encourage higher-level thinking and make colorful year round classroom displays! For 5th grade and up. Middle and high school teachers tell me they’re using them too! Design a Game Book Report An amazing book report. Students create games based on stories they’ve read. All time favorite activity of students, their parents and teachers. Encourages students to read different genre. Have a Game Day! My fantasy literature guide is a fairly recent resource and I’m loving teachers’ comments! Use with any fantasy book or story! Fantasy Essentials Literature Unit Use with any fantasy book or story. – Outstanding! Starting an interactive read aloud with fantasy soon. So many great things to choose from as we delve deep into the genre. Thank you!! – Fabulous! The worksheets provide an exhaustive analysis of fantasy stories and many different perspectives on writing and structure! Frindle Literature Guide 87 pages. This story raises the issue of “free speech” in the classroom. Does free speech include disrupting the teacher by using the word “frindle” instead of the word, pen? Have students read the informational background article about the Bill of Rights, specifically about freedom of speech and freedom of the press prior to reading the story. Movie Review for Students Do your students take videos you show in class, seriously? Use the activities in this packet to keep your students focused as they watch videos in class. Add these sheets to your sub folder! Poetry Task Cards Even your reluctant students will join in the fun! Each card has a definition and sample poem. Book Report Trifold Use With Any Novel Use the pages year to year with any fiction book or story.. Students will be motivated to work for the extra bonus points that are offered! A note to parents is also included with all the instructions about the report and a slip to send back to you. Complete instructions are included. Close Reading Informational Text Polar Bears This is the perfect informational text, no prep resource, to connect English Language arts with social studies and science! The article about polar bears’ lives in the arctic regions of Earth and how they survive, will inspire your students to research these beautiful animals on their own. Creative activities! Questions and answers are included. Scoot Games Get your students moving! Great way to informally assess your students and they don’t even know it because they’re having FUN! Play a game with them and they’ll be surprised teachers also love to have fun!